Per bend paly Or and sable and gules, a bend and in base between the horns of a decrescent a mullet Or. Zaneta Angiolieri, most often called Gavlinne (Gav for short), resides in the Barony of Ruantallan in the Crown Principality of Tir Mara. 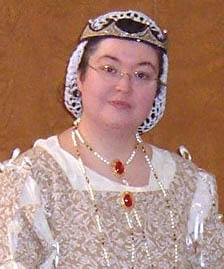 She has loaned her webmaster skills to many an SCA site and Royal web presence, as well as serving as chronicler for both the Barony and Crown Principality. She has also served as autocrat, helped in kitchens, and is the co-founder of the Tir Mara Royal Travel Fund. Gavlinne's interests include music, calligraphy and illumination, beadwork, embroidery, and of course putting her mundane web professional skills to work as a webmaster. She also dabbles in jewelry making and research, but has very much learned that sewing is just not in her skillset. Gavlinne was born in the year 1390 in Siena, Italy to Vitaliano di Alessandro Angiolieri and his wife Zaneta. Although in actuality she dabbles a little bit in the culture and styles of many, being exposed to them via visitors to La Villa Delle Sorelle, the Inn she operates with her sister Mistress Gwenhwyfar. For a full biography, visit http://thevilla.sccspirit.com/gavlinne/gav_bio.htm. For a full list of projects and publications, please visit my projects page at http://thevilla.sccspirit.com/gavlinne/gav_projects.htm. This page was last edited on 7 October 2016, at 13:03.